Allow me first, to express my gratitude to the government of the Federal Democratic Republic of Ethiopia for the worm reception and hospitality extended to us since our arrival to this beautiful city, Addis Ababa. It gives me great pleasure and honor to address you today on the occasion of signing of the loan agreement through which BADEA will contribute to the financing of "Jijiga-Degehabour" Rural Electrification. No doubt, this occasion is a manifestation of the brotherly relations that bind not only Ethiopia and BADEA, but also the Arab world and Africa as whole. At the same time, this event is in line with the ongoing cooperation between BADEA and the beneficiary African countries since 1975, as a good model of South-South Cooperation. The Loan agreement which has been signed today, concerns a project for which BADEA has allocated US$10.00 million, responds to the priorities of Ethiopia as an input to rural electrification which is a prerequisite for sustainable development in general. It promises to contribute to the development of rural population through the provision of reliable electric power supply in the "Somali Region State" close to "Jijiga-Degehabour" in the Eastern part of the country. The project is an addition to the list of projects that BADEA has already financed in Ethiopia, with a total commitment amounting to US$ 116 by the end of 2009, while the total commitment of the Arab National and Regional Development Financing Institutions stood to more than US$ 400 million as at the end of 2009. For sure, that confirms the commitment to the advancement of our cooperation relations. Finally, I would like to extend my wishes of prosperity to the people and government of Ethiopia and to express my full confidence that, the necessary measures will be taken in order to effectively and efficiently implement this project. I thank you all for being here with us today during this ceremony. In its Second Ordinary Meeting for the year 2008, of the Board of Directors of the Arab Bank for Economic Development in Africa (BADEA), which was held in Cairo, Republic of Egypt, during the period 25–27 June 2008, H.E. Eng. Yousef Bin Ibrahim AL BASSAM was elected as Chairman of the Board of Directors of BADEA to succeed H.E. Mr. AHMED ABDALLAH EL-AKEIL who retired in April 2008. Vice Chairman and Managing Director of the Saudi Fund for Development as from 2001. Alternate Executive Director of the African Development Bank and Governor of KSA to the ADB. Director at Arab Fund for Economic and Social Development, the years 2000 until April 2008 and representative of KSA in the Administration Committee of Al-Quds Mosque Fund and elected as Chairman of the said Committee in the year 2000. Representative of KSA to the Administrative Committee of Arab Gulf Programme for U.N. Agencies 'AGFUND' as from 2001. Governor of the Board of Directors of the Arab Open University as from 2002. Chairman of the Board of Directors of the Saudi Industrial Development Fund as from 2004. Chairman of the Board of Directors of the Arab Bank for economic development in Africa starting from June 2008. It is to be mentioned, that the term of office of the Chairman of the Board of Directors of BADEA is two years, renewable. 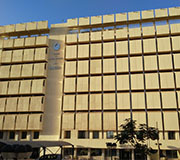 March 4, 2010 -- The first meeting of Board of Directors of the Arab Bank for Economic Development in Africa (BADEA) for 2010 was opened here on Wednesday. Chairman of BADEA's board of directors, Yousef Al-Bassam on the occasion said cooperation between the Ethiopian government and BADEA goes back to the commencement of BADEA's activities in 1975. The Chairman said the financing of the Arab Financing Institutions together (especially, the Kuwait Fund, the Saudi Fund, OFID and BADEA) to Ethiopia amounted to more than 400 million USD until the end of 2009. In spite of this financing extended by BADEA and the Arab Financing Institutions, there is a great possibility to consolidate and promote this cooperation. Albassam said the total financing of BADEA to Ethiopia, which amounted to about 115 million USD until the end of 2009, was earmarked for financing projects in the sectors of infrastructure, energy and financial sector, in addition to financing technical assistance operations in form of grants. BADEA has also contributed to the reduction of Ethiopia's heavy indebtedness as well as extending facilities in the framework of the Program of Financing Exports from Arab countries to African countries. The chairman also assured BADEA's readiness to exert every effort to promote the cooperation and to be Ethiopia's ambassador to the Arab Financing Institutions. Finance and Economic Development Minister, Sufian Ahmed said at the opening of the meeting that currently the bank is financing four road projects, two rural electrification projects, one urban water supply project and one technical assistance with a total portfolio of more than 60 million USD. The minister said furthermore, BADEA is playing a catalytic role in bringing other sister development institutions to co-finance our development projects. Sufian said Ethiopia is making remarkable progress by mobilizing domestic resources and complementary support of development partners including BADEA. The country has registered strong economic performance as reflected in the average real GDP growth rate of above 10 per cent per year during the last six years. He said all sectors of the economy contributed to this growth driven by agriculture, manufacturing and construction. Infrastructure is being expanded to support the acceleration of growth which the country very much needs to sustain to end poverty. The poverty reduction program requires massive resource flow for enhancing agricultural productivity, building human capital, increasing access to clean water and expanding and improving infrastructure. The Bank is still showing commitment to support Ethiopia's development efforts, he said.